Outsource2india is a leading provider of digitizing services that include 3D scanning and measurement offerings. We understand that 2D/3D scanning and digitization or the reverse engineering activities enable you to extract the exact dimensions of a component for reproduction. At Outsource2india, we help you with 3D modeling and drafting of missing components as well as assist you with digitizing historical drawings to create editable, reusable 3D models. 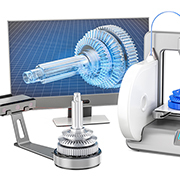 To help you focus on core business activities, we take the load off you with our wide-range of reverse engineering, prototyping, 2D/3D scanning, and measurement services. Be it a point-cloud file or an intelligent PDMS databases or a fully featured 3D CAD based (DWG, DGN etc.) model, we support you with a suitable solution. Outsource2india follows a global delivery framework to ensure our clients get the best service at a cost-effective price. With an extensive list of satisfied clients from around the globe, we provide highly accurate scanning and measurement services for quantifiable process improvement for engineering projects. Manufacturing Requirements - Outsource2india provides apt scanning and measurement services for Manufacturing industries to enable them to spend more time on crucial and inventive activities. We can scan range of products and provide accurate measurements to aid 3D modeling requirement which in turn helps expedite product manufacturing for you. Heritage and Real Estate Requirements - Utilizing accurate 3D point cloud information, we help you create the blueprints for any heritage or ongoing real estate project. Our scanning and measurement services help with clash detection and BIM model creation in CAD or Revit with ease. Outsource2india supports all digitizing and reverse engineering requirements with our efficient 3D scanning and software modeling services. Our team of specialists are professionally qualified and well- trained to understand the criticalness cruciality and intricacy of any project to provide the best options available in terms of technology, resources, and cost. Outsourcing scanning measurement and digitizing services to Outsource2india can help you meet your business objectives at cost-effective rates. Get in touch with Outsource2india to discuss your scanning, measurement, digitizing and reverse engineering project requirements. If you are wondering how 3D laser scanning can help in reverse engineering, read this informative article. Our team will work with you to find the most efficient option and help you meet your project objectives. Contact us today.